On Monday, August 6, 1945, at 8:15 a.m., the nuclear bomb “Little Boy” was dropped on Hiroshima, Japan by an American B-29 bomber, the Enola Gay. An estimated 130,000 people were killed. Over the years and decades that followed, thousands more died from a variety of radiation induced diseases. Even now, after more than six decades, many aftereffects persist, including leukemia, A-bomb cataracts, and cancers of thyroid, breast, lungs, salivary glands, birth defects, and disfiguring radiation burn scars. The psychological damage arising from widespread chronic illness and the destruction of families and communities cannot be measured. For many years, Winnipeggers have commemorated these tragedies and reaffirmed our commitment to peace and freedom from nuclear terror. We symbolize our commitment with a Lantern Ceremony. The Lantern Ceremony is part of an ancient Buddhist Ceremony (O-Bon), that commemorates the lives of deceased loved ones. For many years around the world, this ceremony has been used on Hiroshima Peace Day to honour and embrace the memory of those who died because of the attacks. 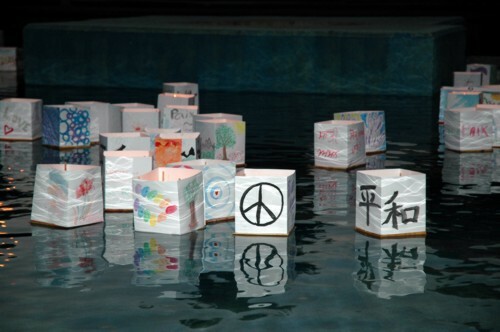 During these ceremonies, participants are invited to design a lantern that represents their thoughts and feelings regarding personal losses, global concerns of peace, nuclear disarmament and any other issue relevant to keeping our planet safe. Sadako Sasaki, a 10-year old girl, became sick with leukemia from the effects of the atomic bomb in post war Japan. She believed in an ancient tale that if you made 1000 paper cranes, you would be granted a wish. She wished for good health. She died before she completed making the cranes and her classmates completed the task for her. Each year, thousands of paper cranes from all over the world adorn the statue of Sadako in the Hiroshima Peace Park in Hiroshima, Japan. As important as it is to commemorate the horrible tragedies of August 6 and 9, 1945, more is required of us to prevent a recurrence of this disaster. Nine countries are known to possess nuclear weapons (United States, Russia, United Kingdom, France, China, India, Pakistan, North Korea and Israel). Together, they possess an estimated 8,000 active nuclear warheads and more than 22,000 in storage. The explosion (accidental or deliberate) of only one of these weapons would cause unthinkable suffering and destruction. The nuclear threat is too serious to be ignored. We cannot rest until each of these nuclear weapons has been dismantled. How you choose to work for a nuclear free world is up to you. There are numerous options. Here a few of the many Internet resources available to help you get involved. 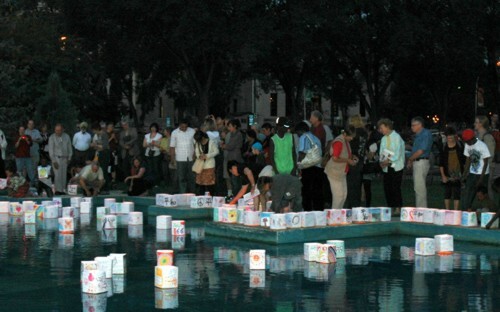 And, of course, you shouldn’t miss out on Winnipeg Lanterns for Peace 2011. Finally, the Canadian Peace Alliance is a good source of information on peace groups across Canada. The important thing is to become informed and involved. On Aug. 6, the 1945 nuclear bombing of Hiroshima and Nagasaki will be marked with a Lantern Ceremony at Memorial Park in Winnipeg. The keynote address will be given by MP Bill Siksay (Burnaby-Douglas) on a private members bill (C-447) now before Parliament for the establishment of a Department of Peace. 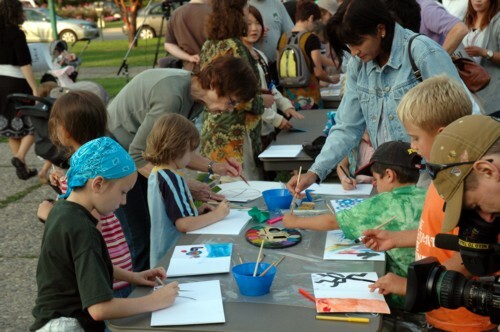 Time: Lantern making begins at 7:30 p.m.; speakers begin at 8:30 p.m.; lanterns will be launched at 9:15 p.m. The annual commemoration of the Hiroshima/Nagasaki bombings is part of a world wide observance held to promote nuclear disarmament and world peace. In Winnipeg, the event is sponsored by the Manitoba Japanese Canadian Citizens Association, Peace Alliance Winnipeg, and Project Peacemakers. In August, 1945, after 6 months of firebombing attacks on 67 Japanese cities, US President Harry Truman ordered the atomic bombing of Hiroshima (August 6) and Nagasaki (August 9). The death toll was enormous – 140,000 in Hiroshima and 80,000 in Nagasaki by the end of 1945. Many more thousands died over the months and years to come from injuries and illnesses caused by radiation poisoning. The Lantern Ceremony is part of an ancient Buddhist Ceremony (O-Bon), that commemorates the lives of deceased loved ones. For many years around the world, this ceremony has been used on Hiroshima Peace Day to remember and embrace the memory of people who died because of the atomic bombing of Hiroshima and Nagasaki. 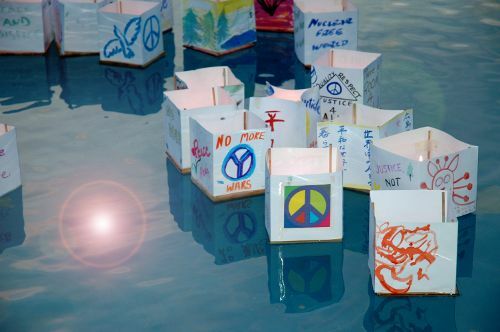 During these ceremonies, participants are invited to design a lantern that represents their thoughts and feelings regarding personal losses, global concerns of peace, nuclear disarmament and any other issues relevant to keeping our planet safe. Sadako Sasaki, a young girl of 10 years old, became sick with leukemia from the effects of the atomic bomb in post war Japan. She believed in an ancient tale that if you made 1000 paper cranes, you would be granted a wish. She wished for good health. She died before she completed making the cranes and her classmates completed the task for her. Each year, thousands of paper cranes from all over the world adorn the statue of Sadako in the Hiroshima Peace Park in Hiroshima, Japan. Bill Siksay, MP (Burnaby-Douglas) is the mover of Bill C-447 – An Act to Establish a Department of Peace. Seconded by Jim Karygiannis, MP (Scarborough-Agincourt ), the bill passed First Reading in the House of Commons, Sept. 30, 2009. Mr. Siksay will speak about this bill at the Lantern Ceremony.